Project Rustbucket: What did I get myself into? Rustbucket needs a tracheotomy, STAT! 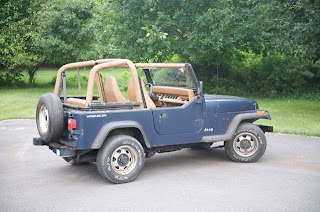 So, I bought an old 1993 Jeep Wrangler YJ off eBay. 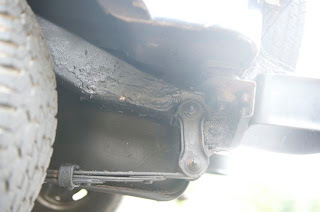 Since I didn't use my old blog at all, I've hijacked it, and am trying to use it as a means to document all the times I bust my knuckles trying to get this jeep from the sad shape it's in, to hopefully a nice rock crawler. To set the record straight, I am not much of a mechanic. 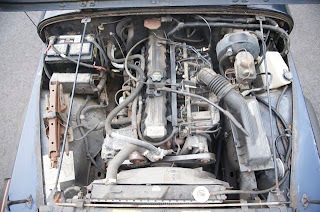 I know how to change oil and tires (though I did have a $360 bill from the last time I changed a tire last week, but that's another story), but I get squeamish anytime I open the hood to a car. One thing I hate about taking my car to a shop is not knowing anything about what is wrong, and not knowing how badly I am being taken advantage of. So I am going to try to do as much shade tree mechanical work as possible on this thing, hopefully learn in the process, but most of all, have fun with it. Mike and I got to the dealer's home in Pasadena (MD) around midday on Monday, and gave the jeep a brief one-over. Like I said, we're not mechanics, so we didn't know much of what to look for. The body and tires seemed in decent shape, and the motor started right up. So I handed over the money, got the signed title, and went to the MVA to get temporary tags so that I could drive it home. The first thing that we did before making our journey back to Carrol County was to remove the top. It gave a new meaning to "Ragtop". Driving it home was quite possibly one of the most terrifying hour of my life. I felt like it may collapse, and I would die at any moment. But it didn't, and I survived. When we got it home, Mike discovered that the rear corner of the frame where the suspension connects to it looked like someone did some patch work and spray painted over it to hide the work. I started freaking out about this because (a) it could have collapsed on my way home, and (b) a new frame would cost about $2500 for just the part, and (c), that would involve pretty much building the jeep from the ground up... way more that I bargained for. I took the jeep to a body shop at the suggestion of a friend, and the guy that gave me an estimate told me that they could just weld on some metal, and it would be as good as new. And it'll only cost about $400, and it should only take a day in the shop to complete. Boy was I relieved! I am planning on getting that taken care of when I buy the new suspension for it (Rubicon Express Extreme 4.5" suspension lift kit) so that we can make sure everything fits properly. 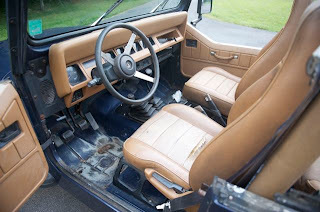 Leather seats, but they smell pretty bad (mold). Dani told me that I had to replace them if I want her to come wheeling with me because she's allergic to them. This entry was posted on 10:22 PM and is filed under jeep , jonesgeeks . You can follow any responses to this entry through the RSS 2.0 feed. You can leave a response, or trackback from your own site. Dude, I could totally get my father in law to take a look at it. I guarantee you he could assist in that area since he is a mechanic and all.